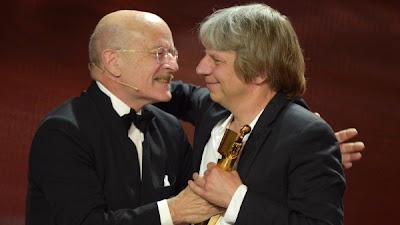 The Deutsche Filmakademie (German Film Academy) held its 62nd Deutscher Filmpreis (German Film Awards) tonight at the Berliner Friedrichstadt-Palast. Taking the top prizes was Andreas Dresen's cancer drama Halt auf freier Strecke (Stopped on Track). It won four awards including the top prize of Best Picture – Gold. Dresen won for Best Director while Milan Peschel won Best Actor and Otto Mellies claimed the Supporting Actor prize. Previously, the film shared the Un Certain Regard prize at Cannes in 2011 with Kim Ki-duk's Arirang. Roland Emmerich’s pseudo-historical Shakespeare drama Anonymous captured more trophies. It took a total of six, but they were all in the technical/craft categories. Christian Petzold's Barbara had led with eight nominations. Its only prize though was the Silver Best Picture award. The Bronze Best Picture winner was Kriegerin (Combat Girls) which also won for Best Screenplay and Actress (Alina Levshin). The Best Documentary prize went to Gerhard Richter Painting by Corinna Belz. Johannes Schmid's Wintertochter (Winter's Daughter) won the Best Children's Film award. In addition to statuettes, the Lolas award nominees and winners cash prizes from a pool worth € 2.955 million. Each Documentary nominee will receive € 100,000 but the winner receives a total of 200,000. The Children's Film nominees get € 125,000 with the winner getting € 250,000. Each Best Picture nominee receives € 250,000, but the winning amount increases to € 375,000 for the Bronze winner, € 425,000 for the Silver winner, and € 500,000 for the Gold winner. Individual Lola winners will receive € 10,000.